Contrary to what most books on the subject will tell you, postmodern philosophers were universally in agreement regarding three important philosophical beliefs in their writings. The first belief they universally shared was antiessentialism. Anti-essentialism makes the ontological claim that no identities have essential properties, but are accidental constructs of a variety of contingent material forces. “An essential property of an object is a property that it must have while anaccidental property of an object is one that it happens to have but that it could lack.” According to antiessentialism, everything is a construct. The third belief, following from the first and second is that all ontological and epistemological relationships are reducible to power (read: politics). If everything is a construct, then nothing is necessary. If nothing is necessary, then no attempt at controlling a particular subject [say, the human body] via definition, empirical study, or the axioms of Scripture is legitimate. And if this is so, then universal rebellion (against beliefs, philosophical systems, religious systems, scientific discourse in all of its variations) is legitimate. Not only is it legitimate – it is inevitable. As one would expect, this encouraged dissent from socio-political structures of every stripe. Likewise, as one would also expect, it encouraged advocacy for marginalized members of society (e.g. non-white/non-european ethnic minorities). Insofar as the postmodern turn helped deconstruct slanderous stereotypes and curb sinful behavior against fellow bearers of the image of God, it was not all bad. Nevertheless, because there were no essences, no absolute moral standards to judge whether political oppression or political liberation is good or bad, no absolute standard by which we could judge one philosophical system as true over and against the others which are false – the benefits of such deconstructive analyses were short lived. In postmodernism, there are no essential subjects (e.g. universal Man) but only historically contingent subjectivities (i.e. subjects that are composed of accidental properties which can change at a whim). Consequently, under postmodernism there would be no essential difference between Naziism, on the one hand, and the Civil Rights movement, on the other hand – both movements would simply be attempting to obtain and exercise power. Right and wrong, accordingly, could not be understood universally. Yet if everything is a construct, i.e. reducible to parts, then everything shares the property of being constructible, i.e. being put together or taken apart over the course of time. If this is the case, then what we are facing is, in fact, not at all a form of anti-essentialism but a deeply rooted belief in the essentiality of matter. The philosophical position that marks postmodernism, therefore, is a thoroughgoing materialism. I have written on this topic elsewhere, so I won’t delve too deeply into the matter here. What must be noted, however, is that the metaphysics espoused by postmodernist philosophers was not given much emphasis by many. 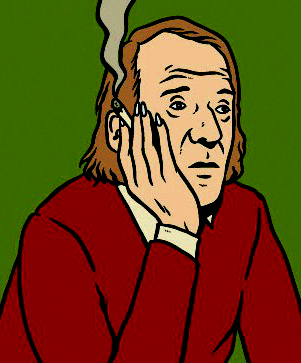 It was perhaps Gilles Deleuze, a French postmodern metaphysician, who alone was bold enough to openly preach the metaphysics of postmodernism, declaring that pluralism is monism. The belief that materiality is one, although materiality’s manifestations (i.e. every construction conceivable) are infinitely varied/varying, is not surprising seeing as German Romanticism and Darwinian Evolutionism, for which German Romanticism, aesthetically developing monistic trends in philosophy, apparently paved the way, formed the materialistic-monistic ground from which postmodernism eventually grew. Ironically, however, the postmodernist attempt to identify the radical multiplicity of kinds of philosophies, “valid” expressions of religious beliefs, gender, and sexual orientations as essentially identical has returned full-circle, affirming the kind of oppressive reductionism that postmodernists wanted to, in principle, eliminate from academic and popular thinking. See The Fundamental Axiom of Postmodernism, https://www.academia.edu/5547058/The_Fundamental_Axiom_of_Postmodernism. For a more detailed discussion on this subject see Deleuze, Gilles. “Dualism, Monism and Multiplicities (Desire-Pleasure-Jouissan),” in Contretemps 2 (May, 2001), 92-108. Greg Bahnsen gives a quite thoroughgoing history of the development of materialistic monism’s popularity in his article “On Worshiping the Creature Rather than the Creator,” in Journal of Christian Reconstruction —800/553-3938. I:1. See Diaz, Hiram. The Romantic System of Thought: Unearthing William Blake’s Axioms,https://www.academia.edu/5547421/The_Romantic_System_of_Thought_Unearthing_William_Blakes_Axioms; Richards, Robert J. “Darwin on Mind, Morals, and Emotions,” in The Cambridge Companion to Darwin, eds. J. Hodge and G. Radick. (Cambridge: Cambridge University Press, 2003), pp. 92-115; Darwinian Heresies, eds. Abigail Lustig, Robert J. Richards, Michael Ruse. Appreciate this, thanks, as well your linked paper “See The Fundamental Axiom of Postmodernism”, thanks again.